To make a balloon daisy first you have to inflate a long balloon. Make a loop of it as shown and then divide it in half. Twist it at three points so that it is divided in 3 equal segments. Fold the segments over each other and pinch both the ends in your fingers. Then bring both the ends together in the centre. 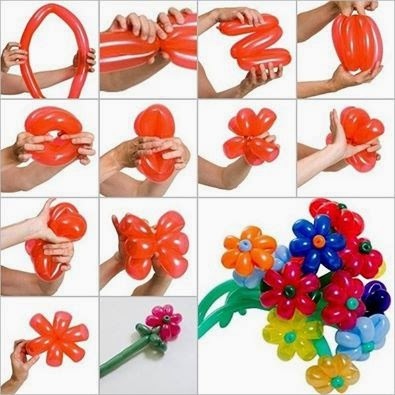 Then twist the balloon in the centre to form a flower. Inflate another long balloon and fix its top part in the centre of the daisy.